With the recent signing of the 2018 Farm Bill, a comprehensive reclassification of hemp and hemp products, an important first step in introducing the nation at large to the possibilities of CBD has been taken. Because of this new availability and social acceptance, many are looking into CBD for the first time and curious about trying it. For anyone who’s new to CBD or simply wants to learn about some key reasons to give it a shot, check out our list of the top 3 reasons to try CBD below. CBD first came to larger recognition for its use as a treatment for rare forms of epilepsy, especially in children. The US government agrees with this efficacy, as it holds a patent for the CBD-derived drug Epidiolex for this exact reason. Epilepsy is especially difficult to treat in children due to the harsh side effects of traditional medications. In addition to effectively fighting seizures, the minimal side effects of CBD and nearly zero health risks (as confirmed by the World Health Organization) are what make it a viable treatment for children. Furthermore, CBD is shown to play a large role in the endocannabinoid system, which helps regulate a host of bodily functions, such as memory, appetite, stress response, sleep regulation, and pain perception. Accordingly, this is how CBD is able to help manage a wide range of ailments. CBD’s large potential to help and minimal adverse effects make it an attractive option for many seeking relief. CBD has shown to have complex interactions with its fellow cannabinoid, THC. More specifically, CBD has shown to be able to counter the difficulty with memory encoding that THC can produce by being present in an amount equal to or greater than THC in a mix. Possibly the most sought-after effect of CBD, it’s calming qualities, can also help curb anxious or paranoid feelings induced by THC. The unique synergies that happen between the two compounds are still being explored though as results have not yet yielded a definitive understanding of the interactions between the cannabinoids – largely due to a lack of scientific research on the matter. Subjects have shown a range of interactions, displaying the ability for CBD to both inhibit and enhance THC. Anecdotal reports of using large amounts of CBD to stop a racy high in its tracks are common in the industry, and some CBD products are even formulated for this very purpose. Many cannabis consumers have found a balance of both to be beneficial, however some trial and error may be needed to find the exact ratio and amounts of each that work for your individual chemical makeup. 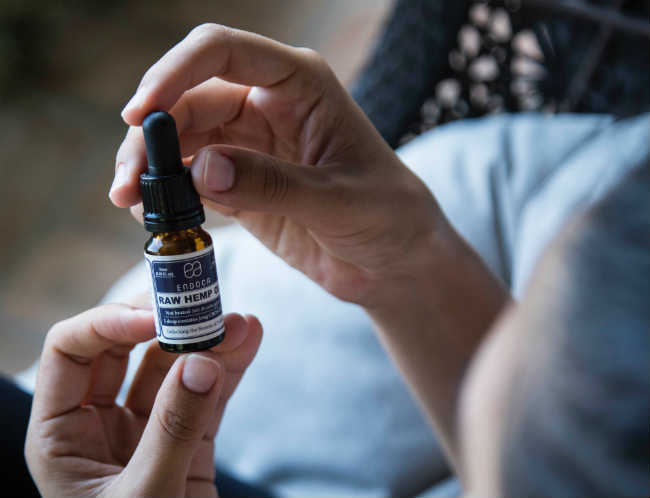 The vast majority of people discovering CBD seek it not for direct health benefits like better sleep, or pain regulation. Rather, they enjoy CBD simply to calm down. Modern life is often high-stress with little rest, and CBD products offer some respite from the hustle and bustle. It can be somewhat difficult to describe a pronounced calming effect that is non-narcotic or hallucinogenic, which makes this aspect of CBD more difficult to communicate to newcomers. For this reason, detractors of CBD claim the calming effect to be placebo or psychosomatic. However, scientific inquiry into CBD supports these claims, even showing CBD to help with social anxiety where other treatments have proven to be ineffective. With the rapid proliferation of CBD across the market, the only concern one should have about the substance is sourcing. California recently passed its own set of CBD laws before the Farm Bill in an effort to stop bad actors from creating things for human consumption that were not grown or regulated as such. While the wider availability of CBD is a generally good thing, this is the double-edged sword part of deregulation. When buying CBD, try to seek out products sourced from reliable growers and producers who show laboratory testing to back up the claims they make. Ensure that the testing results are reflective of what is actually in the package. It is best to avoid products that mix CBD with other natural oils. While these substances may offer health benefits as well, many are untested and not recommended for human consumption, but lack a regulatory body to stop them from being marketed this way. These types of products are already on the market, and can be difficult to discern from more reputable offerings. Buy with caution and do your research as best you can and you’ll find yourself experiencing some really great CBD products! Just don’t consume and CBD flower before a drug test and you’ll have nothing to worry about. Have you tried CBD yet? If so which products? Did you have a positive experience? Share your thoughts in the comments below! Matthew Mongelia is a freelance writer hailing from Miami, Florida and now hangs his many hats in Denver. Matthew is the co-creator of the comic Dark Beach, and an avid enthusiast of chocolate and short fiction.